Really, it couldn’t have been easier. He needed two cinder blocks laid longways & stacked on top of each other for each corner of the stand. 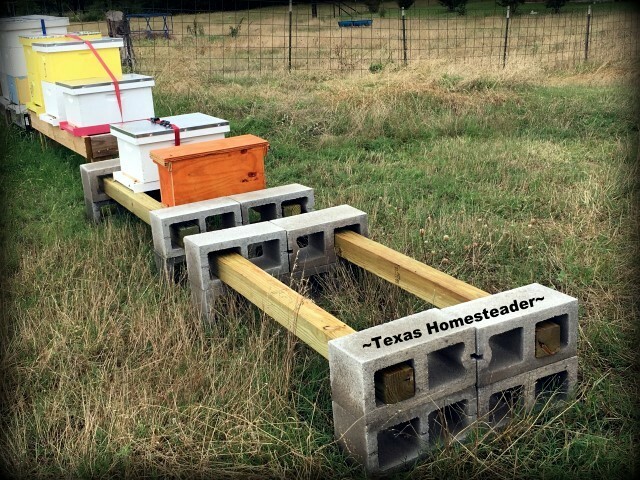 So for each 5-ft long beehive stand he’ll need two 5-ft long 4″x4″ wooden posts and 8 cinder blocks that measure 8″x8″x16″. We built two 5-ft long hive stands with just the material pictured below! After the concrete blocks were in place he slid the 4×4 poles through the holes in the cinder blocks. BOOM! Table for 25,000, no waiting! He could probably fit three hives on each stand, but he wants to limit it to only two hives per stand. He finds it’s easier to work around them when the hives are not too close together. 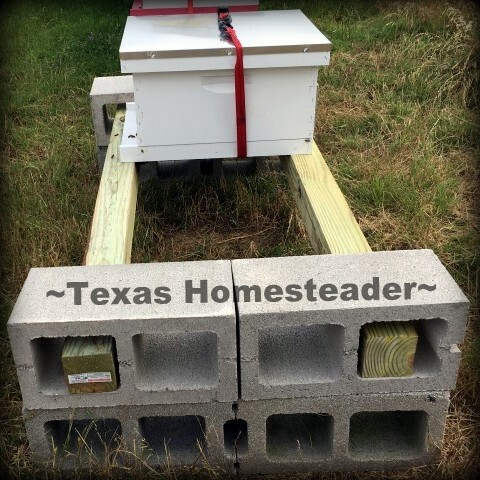 In the picture shown in the first paragraph his hive stand is holding a regular single-deep hive and a nuc box with a recent swarm capture. When we move this swarm from the nuc box to a deep box hive, the spacing will be about right for his comfort. These stands are just a touch shorter than the other hive stands he built. But he found that he actually prefers them a little shorter. Although he’s a handsome 6′-4″ tall RancherMan, when the hives get two deeps and a honey super (or two) stacked, that’s about shoulder high for him. This slightly shorter stand actually makes it easier for him to lift those heavy top boxes off when he’s inspecting or when we (gulp) harvest the honey! In the picture below you can see the slight difference in height between our concrete block hive stands and the ones we built initially. He loves that he can put these stands together in 5 minutes or less. Apparently this year with so many swarms available, time is of the essence! We already have one hive stand filled & another built and standing ready. 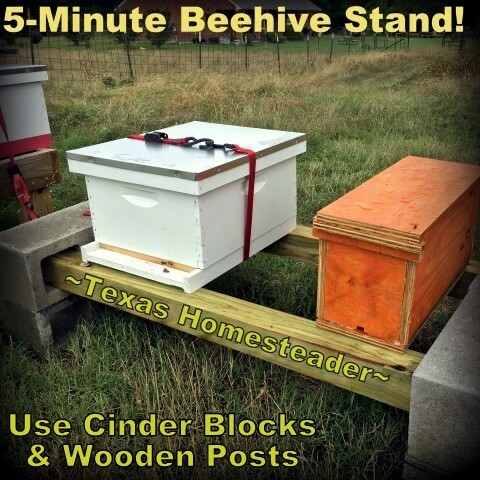 Let’s learn from each other – what do you use for hive stands? It just goes to show that we get better & better with practice & experience – whatever the task. We are convinced that beekeeping is part science, part art and lots of luck and yes each beekeeper needs to decided what works best for them. I post occasionally on my blog about beekeeping you can check it out if you want. ‘The Taylor Made Bee Farm’. What a great and cheap solution your man came up with. Cinder blocks; another great idea on list of ‘many uses.’ I enjoy seeing your bee hives from this distance………… :} Boy, did I ever get sunburned yesterday working on my shed and Exhausted. Got the walls up and only 1 sheets of siding up so far. Tammy; and you as well RancherMan; have an enjoyable weekend. Happy Bee Hive hunting.